This enraging and heartbreaking documentary from Canadian student Jonathan Pedneault and filmmaker Alexandre Trudeau tells the story of the pair's trip to Darfur to investigate reports of genocide. As Pedneault and Trudeau make their way clandestinely into the heart of the Sudanese war zone with a group of rebels, they come upon refugees fighting for water, NGOs struggling to get food to the starving, and people battered by civil war and incomprehensible violence stumbling into camps on the edge of survival. The result is a story of remarkable courage and unfathomable despair. "This is a moving, impacting documentary about the ongoing conflict and horror that has been imposed on the non-Arab Sudanese people by the Islamic government of Sudan... With variety of content, impacting visuals, and well-paced structure this is a captivating film from beginning to end. The primary purpose of this documentary is to put real faces on the people of Darfur and to give a voice to the victims of these hateful atrocities. The filmmakers have done an excellent job of accomplishing this with quality filming, excellent narration, and informative personal interviews. The documentary also asks why this is happening and suggests the various possibilities such as oil, ethnicity, climate, water, power, and politics... 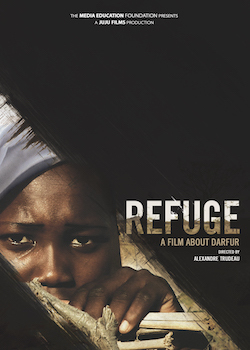 This film offers an important view into the current situation in Darfur and a much needed call to action. Highly recommended."